Drawing on family tradition, Andy Timmons began farming in the High Plains of Texas. Drawing on experience, he branched into grape-growing after years of cotton and peanuts. Drawing on the wisdom and inspiration of neighbors, he expanded into winemaking. We are drawing the rewards. When Timmons’ nephew, Andrew Sides, married, it was not just a union of hearts; it became a union of dreams. Together with Sides’ father-in-law, Troy Ottmers, Andy and Andrew began Lost Draw Cellars. Ottmers’ property in Fredricksburg had been in his family for generations. He was already involved in the Texas wine world and ready for the next challenge. It became just the place to showcase Timmons’ talents. On a recent return from Garner State Park, we decided a brief stop at a winery would be just the way to end the weekend. But it had to be just the right place. Clean but casual, with kids in tow, our choices were limited. We wanted to try something new, low-key, with great wine. After some research and consultation, we came up with a winner. 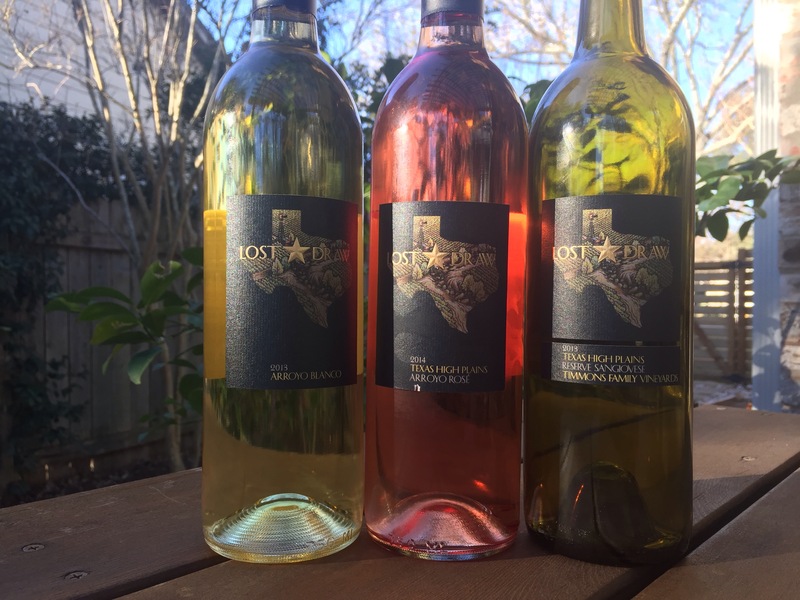 Lost Draw Cellars’ wines are fresh and honest, approachable and interesting, balanced and lively. It is no surprise that I loved them. It turns out his grapes are in many of my favorite Texas wines (including both I promoted for Snooth) and they are being made by Kim McPherson, another favorite. The standouts, for me, are the blends and one funky, fun reserve. Arroyo Blanco, Arroyo Rosé, and Arroyo Rojo are delightful. I’ve often leaned towards to Rhône varieties here and his wines are further evidence that they are well-matched with our growing conditions. The Reserve Sangiovese was a fun surprise. Not exactly typical, or at least not in my experience. Perhaps it was the old vines, perhaps something more. It was rich and bold, red fruit and tobacco with a little funk. The funk felt old world, the fruit new. It begged for bistecca fiorentina but that wasn’t happening when you pull in at dark after a weekend away. It settled for pizza and did not complain. When reviewing a stop at a winery, I draw on my experience with the wines, my interactions with the people, and the overall feel of the place. They are serious about wines without taking themselves too seriously. They are welcoming and knowledgeable, making the novice feel safe, but able to provide a soil- to-bottle scope of information for “advanced” wine-lovers. Lost Draw Cellars draws just the right balance. But I think I may need a few more visits, just to be sure. Many thanks to Jeff Cope for the recommendation and Andy for taking the time to chat with us! Excellent. I will have to give them a try! Thank you!